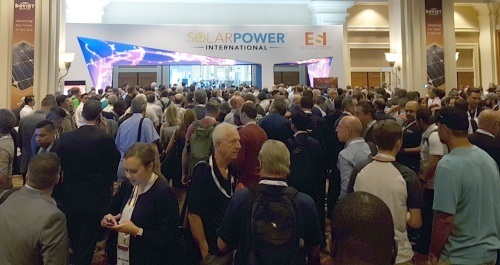 We just returned from this year’s Solar Power International Conference inspired and a little tired after spending three full days learning and networking with leaders in the solar power industry. What struck us most about the event was its sheer size, more than 20,000 people attended this year’s event held in the Mandalay Bay Convention Center in Las Vegas, NV. We are thrilled to see how big of a sector solar has become, creating jobs and clean energy for our planet. Solar panel with a clear back sheet. 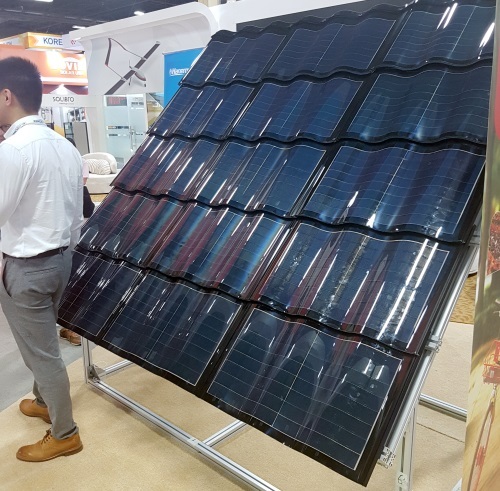 One of the biggest product growth areas is innovative solar products that can be used in place of other building materials. We saw beautiful, semi clear solar options, and even an all-glass solar panel, that can be used for awnings and covered patios. Solar-covered carports, especially for commercial scale were also on display, showing the ingenuity of shading one’s car while also generating electricity on a large scale. We see this as a perfect application for businesses in the Okanagan who want to provide a comfortable experience for their customers, and decrease or eliminate their electricity bills. 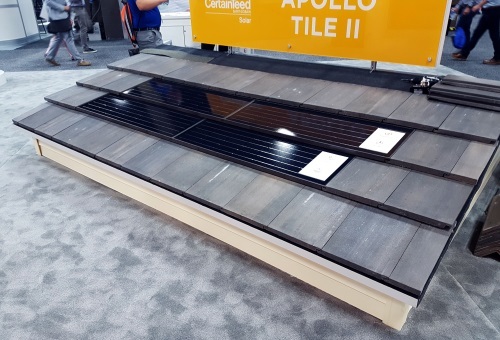 While Tesla Energy was not in attendance at the conference, other solar roof tile companies were, showing esthetically pleasing products ranging from clear glass roof tiles to “peel and stick” roofing membranes. 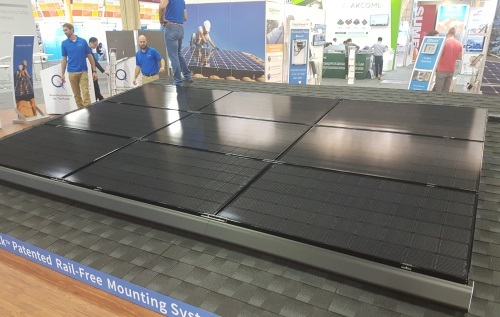 We still believe more research is needed on the solar roof tile options to ensure they can meet their warranty demands but we enjoyed getting to explore the latest product options available. Solar modules continue to increase in efficiency with new modules tailored to specific situations like intense heat (think the Okanagan) or to minimize shading issues. 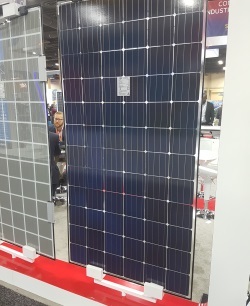 All back LG solar modules with a rail-less racking system. Other small changes to modules like relocating junction boxes and reducing cell sizes are helping to achieve better performance and a quicker, cleaner installation. 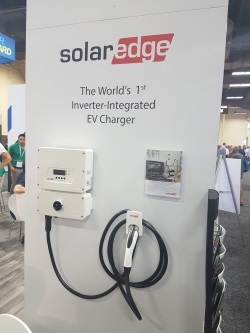 Probably our favourite product at the event was seeing the new SolarEdge inverter and car charger. With this model, you not only have one of the best inverters on the market but you no longer need to invest in an electric charging station for your home. We can’t wait to install one of these for our clients soon. Judging by the number of manufacturers representing battery storage, this is a major growth area for solar. It’s clear that in the next 5 years homes in many areas of the globe could be generating and storing their own power independent of the grid. As we’ve mentioned in our blog announcing that we are certified Tesla Powerwall installers, battery storage, or lack thereof, has been one of the weakest links for solar uptake globally. We’re excited to see new products entering the market and advancements in critical areas like battery storage. It’s innovations like these that have countries like China, India and even the United States cancelling or shutting down coal-fired power plants and opting for solar. As an example of the rapid uptake for solar globally, we heard China will implement about 20 times more solar in the fourth quarter of this year than what currently exists across Canada! This is great news for our environment, and a bright spot as the world beings to experience the effects of climate change. We left the conference feeling more optimistic than ever of the potential for our world to transition to a 100% renewable future. This potential was not something anyone predicted even 10 years ago. While progression continues unabated, let’s not forget to celebrate all that solar has accomplished. Kudos to everyone at the conference who are helping make this happen.